If a woman is experiencing fatigue on a regular basis during menopause, she may wonder if there is a more serious underlying condition behind it. 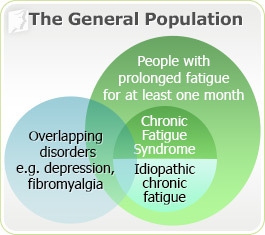 While chronic fatigue syndrome (CFS) is a not as common as mild fatigue, it affects a high percentage of the population. Studies suggest that anywhere between 1 and 4 million Americans suffer from this syndrome, which leads to serious disturbances in daily life. Keep reading to learn more about chronic fatigue syndrome in order to distinguish it from the milder fatigue that is typical for menopausal women. Chronic fatigue syndrome is a disorder that is hard to pinpoint, as it involves a variety of factors. Generally speaking, it is characterized by a severe fatigue that lasts longer than six months and is not the result of extreme effort nor is it improved with bed rest. Because there can be many causes and forms of fatigue, chronic fatigue syndrome is commonly under-diagnosed, with only an estimated 20% of the several million cases in the U.S. having been properly diagnosed. Diagnosis of chronic fatigue syndrome involves assessing its duration - that is, that a person has experienced fatigue for longer than six months - and the presence of a list of symptoms. Keep reading to learn which symptoms are particular to this syndrome. While chronic fatigue syndrome seems to affect some people randomly, there are certain risk factors that make some groups more likely to experience this syndrome than others. Women are four times more likely to experience chronic fatigue syndrome than men, although this could be due to the fact women are more likely to report symptoms. CFS is most common among people in their 40's and 50's, the age when most women go into menopause. This leads to the common misconception that other menopause symptoms are signs of chronic fatigue syndrome. Read on to learn more about the most common causes of chronic fatigue syndrome in order to learn how to best manage the symptoms. While the definite cause of CFS is unclear, there are many theories for why it occurs. Because its symptoms may appear similar to other long-term infectious diseases such as mononucleosis, one theory suggests CFS itself is also caused by a virus, though no single virus has been isolated. Other theories regarding the cause include an immune system disorder or nutritional deficiencies. Again, because the definite cause is inconclusive, treatment is very difficult. However, there are ways to manage the symptoms. Keep reading to learn more about coping techniques for chronic fatigue syndrome. No cure has been found yet for chronic fatigue syndrome, though there are certainly management techniques that have been able to help alleviate the symptoms. Stretching exercises such as yoga help to reduce stress and calm the body. A balanced diet helps regulate mood and leads to increased energy levels. Avoid caffeine, alcohol, and stimulants. Support groups provide a sense of community. Again, however, common fatigue is often mistaken for chronic fatigue syndrome. As fatigue during menopause is most often caused by low hormone levels, balancing those hormone levels is typically the most effective solution. Although there are several ways to manage fatigue, the safest and most results-driven path is to combine different management techniques, such as different lifestyle approaches with alternative medicine. Click on the following link to learn about specific treatments for fatigue, which begin with lifestyle changes, move on to alternative medicines, and finally, if those options don't seem to help, medical interventions. The most effective treatments for fatigue typically combine lifestyle changes and alternative medicines.